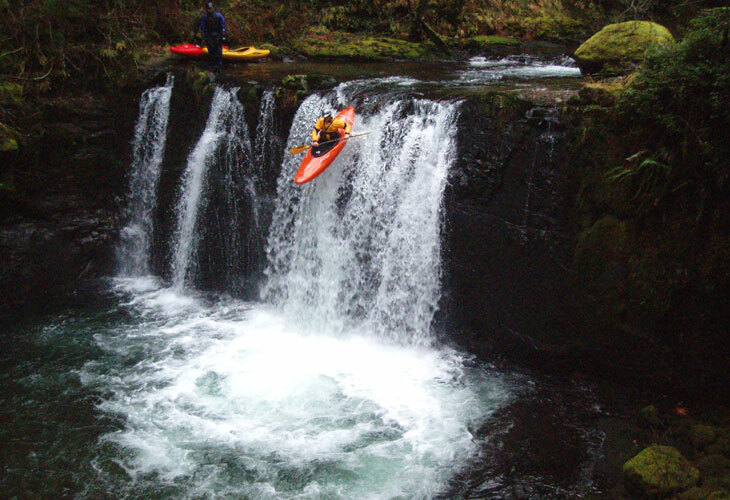 I have been thinking about Upper Siouxon Creek since November of 2001, when John Whaley and I paddled middle and lower Siouxon from Chinook Creek to Yale reservoir. The middle and lower stretches of Siouxon Creek had turned out to be marginally enjoyable, alternating between huge, unrunnable drops and flat, boring class II-III. When I finally ventured up onto Upper Siouxon in December of 2004 I discovered (much to my surprise!) a kayaking wonderland, jam-packed with ledges, falls, and never-ending bedrock slides, all nestled in an awe-inspiring old-growth forest. 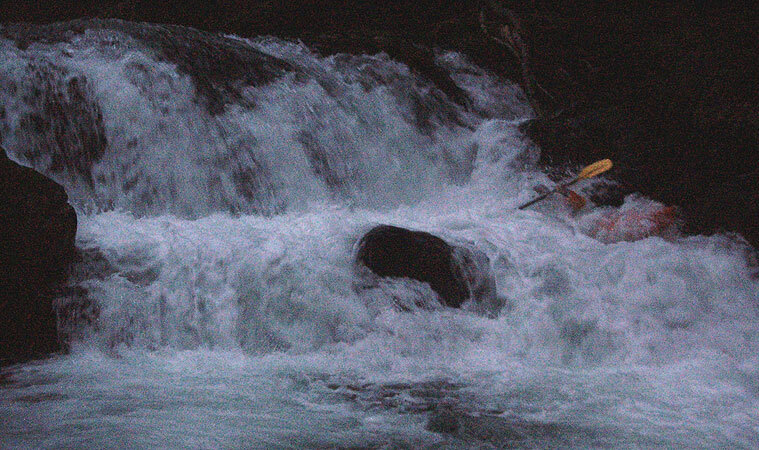 With the exception of 35-foot Middle Siouxon Falls, all of the ledges and falls on this section are low-stress, clean, right-down-the-middle affairs, making any trip down Upper Siouxon a fun, memorable paddling experience. As if the creek itself isn't good enough, the Upper Siouxon drainage is almost totally uncut and boasts some of the most magnificent cedar and pine old-growth timber you will ever see. The Siouxon drainage is immensely popular with hikers, who we can thank for the excellent, well-maintained trails that allow us to access this creek. A FALL SEASON TO FORGET.. SALVAGED BY SIOUXON! It was December 2004, and the fall season was shaping up to be a total bust. Rainfall had been spotty and unusually hard to predict, and several 'large Pacific storms' forecast by our friendly ( but hopelessly unreliable ) weather people had failed to materialize. 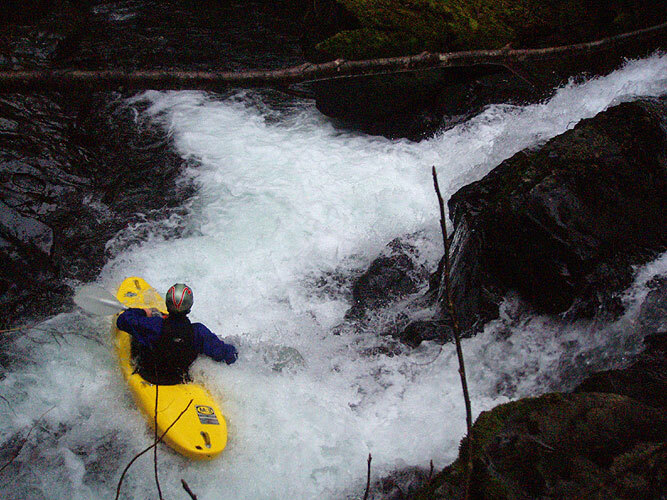 As of December 2004 we had paddled about two rain events, which was nearly an all-time low, rivaling the year 2000 'Fall of Doom' when Oregon's rainfall reached all-time lows. On this particular adventure we were joined by the ever-ready Jesse Coombs and James Bagley Jr. out of Corvallis. We met at the Jantzen Beach Safeway at 8 a.m. and headed north. We set shuttle at the trailhead just downstream of West Creek, which is the dividing line between the Middle and Lower Siouxon runs. Just to be sure we would recognize the take-out, we hiked down to West Creek. When we reached the creek, we decided to try and find more easily accessible take-out, so we crossed the log bridge over the creek and settled on a nice take-out at West Creek campground, just upstream. After cross-loading the gear we piled into James' truck and headed upstream, with Pete plotting our movement with his GPS and printouts from his topo software. A great view of the Upper Siouxon Creek drainage, taken at the beginning of the shuttle. Upper Siouxon Creek winds down the middle of the photo. This drainage is totally uncut; some of the trees on the hike in are gigantic, 400-year old patriarchs. This is the way forests were meant to be..
At one point during the shuttle we decided to try a 'short cut', down FR 57, which passed on the north side of West Point Peak. 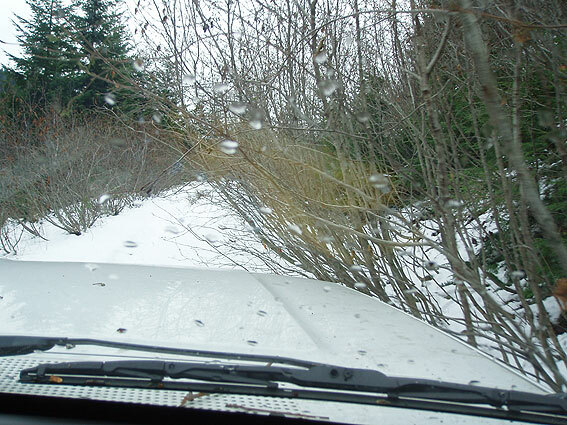 However, as is often the case, our short cut became a 'long cut' as FR 57 deteriorated rapidly and became overgrown with diabolical red alder that seeming intent on breaking off everything that stuck out from James' truck.. Finally, after some stressful moments our sketchy little 'short cut' road joined back up with the main road and we made good time to the put in trailhead. Attack of the Alders during the shuttle.. parts of the 'shortcut' we took down FR 57 were badly overgrown.. it was touch-n-go a few times there! James' truck took quite a beating on this trip. The trailhead where we began our hike down to Upper Siouxon (the trailhead has an elevation of 3,556 feet). When we reached the put-in at the confluence of Calamity Creek we were thrilled to see that the creek started off immediately with some small ledges. That said, we were very concerned about the low water. We had been expecting a huge rainstorm the night before, but it hadn't materialized as expected, so we had very little water in the creek. Undaunted, we decided to put on and try to work our way downstream. Just around the corner from the first couple of ledges was a log portage, then we reached a big horizon line. Pete got there first and started grinning, because we had a beautiful, clean waterfall below us. James went first to shoot video, and I climbed up to the hiking trail and circled around to a nice overlook just downstream to shoot photos..
You have to wait about 3 seconds to see action on Upper Siouxon. The ledge in the background is twenty feet below the put-in.. There are so many ledges of this size on this run, I lost track of them all. We were pretty disappointed with the lack of water in the creek when we got to it; the large rainstorm predicted for the night before hadn't materialized, so these uppermost sections were pretty scrapy..
Downstream we gradually picked up more water as some small tributaries trickled in to the run. The rapids were just excellent on this section, featuring every kind of ledge and slide imaginable. Eventually I reached a monster horizon line, and when I got out to scout I found a monster falls. "Looks like a 30 or 40 footer!" I yelled back to the rest of the group, who had arrived in an eddy upstream. I had no desire to run this drop, so I climbed up to the trail and walked around the falls, where I was soon joined by James. Pete and Jesse lingered for awhile longer, but in the end Pete decided to walk it as well, leaving only Jesse still looking at the drop. Pete Giordano and Jesse Coombs scout Middle Siouxon Falls. This complex, technical waterfall drops about 35 feet into a bottomless green pool. Middle Siouxon Falls is not a 'gimmee' drop, because the lead-in careens off the right wall before plunging over the final vertical drop. Jesse scouted it for about five minutes from both sides of the river before giving a 'thumbs up' and then getting back in his boat. 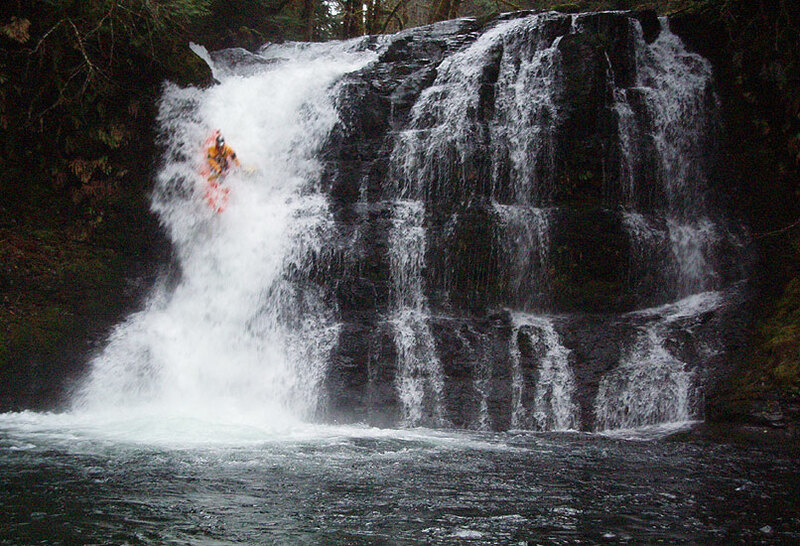 After a moment or two he came hurtling down, ran the tough first ten feet with style, then sailed off the final 25-foot drop with perfect angle..
Jesse Coombs cleans Middle Siouxon Falls. This photo does not do this drop justice, because the series of lead-in ledges drop about ten feet by themselves, and that's before you get to the big vertical plunge.. Unlike Upper Siouxon Falls, this drop earns a strong class V rating. At this point we were running out of light. The 'short-cut' on the shuttle had consumed more time than expected, and we only had about an hour of daylight to go almost four miles. There were more fun drops on the lower half, lots of 6-8 foot ledges of all shapes and character, very fun stuff! We hit the hiking bridge over the creek at the confluence of Chinook Creek with less than an hour before dark; from here we started sprinting downstream, running the fun class IV ledges and then the big double-drop falls just above Lower Siouxon Falls..
Running out of light.. Jesse runs the double falls as darkness falls just above Lower Siouxon Falls ( Lower Siouxon Falls is solid class six ) on Siouxon Creek. 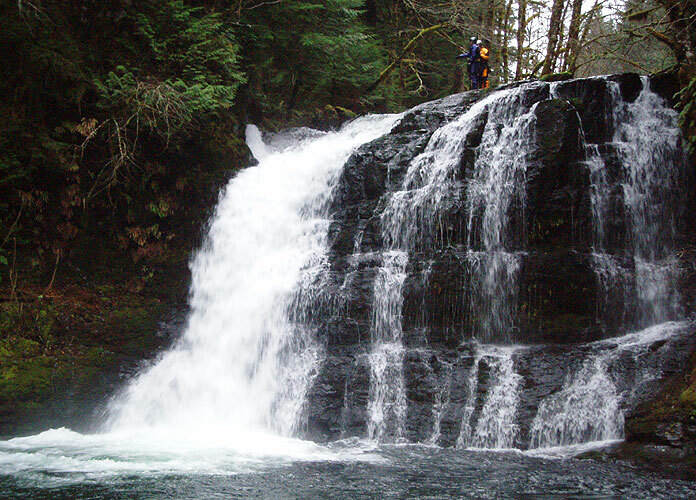 We reached Lower Siouxon Falls, which is a nasty class six 40-footer. Jesse scouted this drop briefly and then portaged with the rest of us on the trail. From here there are no real rapids before West Creek Campground, so we sprinted downstream, arriving at the campground with almost no light left. 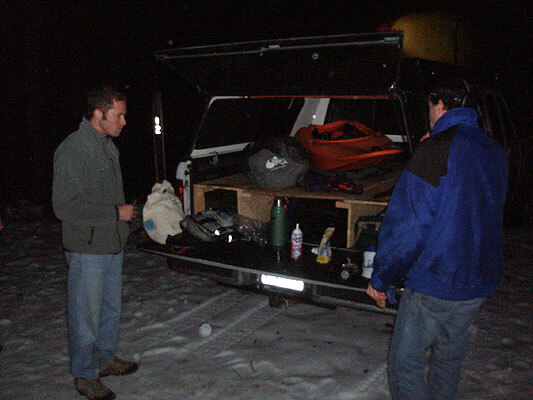 By the time we completed the quarter mile hike back up to the car, it was totally dark..
We loaded up my car and headed back up into the hills, and spent another hour reaching James' truck (the roads were covered with snow and very slippery!). Once we reached the truck, James broke out the food box and whipped up some hot Irish Coffee, complete with whipped cream! It was snowing at this point, very cold, but we had just completed a long day of boating on a new creek, and it doesn't get much better than that..
Jesse Coombs and Pete Giordano enjoy Irish Coffee (with whipped cream!) courtesy of James Bagley Jr. while the snow falls at 3500 feet..
We got skunked on water when a predicted rainstorm failed to materialize, leaving us with the EF Lewis at 600 cfs, which translated into a trickle in Upper Siouxon. I would recommend at least 1,500 cfs in the EF Lewis after a major rain storm for this run. Also, make sure the snow level is above 4000 feet, because otherwise the rain will get locked up as snow and you won't have enough water. First, I recommend using a GPS and a very good map in this drainage, because the roads can get confusing. The put-in trailhead is located at: ( GPS Coordinates: 45.92995 N, 122.06411 W ); the take-out trailhead is located at: (GPS: 45.94665 N, 122.17742 W). 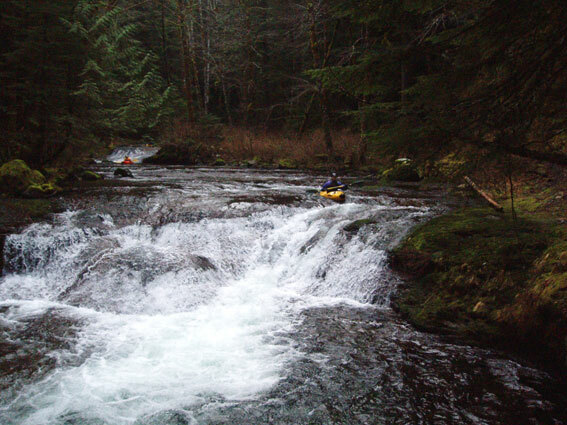 To reach Upper Siouxon, follow the Bennett guide instructions to the put-in for Canyon Creek Washington at Fly Creek bridge. Continue past this bridge 5.18 miles to road 57, which is a paved road that turns up and to the left. From here, turn drive up 1.15 miles and turn left on FR 5701, drive 3.61 miles down to where this road ends to reach the trailhead that leads down to West Creek Campground ( about a quarter mile hike to the campground from the trailhead ). To reach the put-in, return to FR 57 and drive 2.48 miles east towards West Point Peak (the most obvious terrain feature in that direction), where the road splits. As you approach West Point Peak, do not make our mistake and veer left on FR 57; this road gets bad in a hurry. The best route is to turn south on FR 5704 and cut around the south side of West Point Peak ( both FR 57 and FR 5704 will get you to the put in eventually, but FR 5704 is faster ). The trail that you use to take out at West Creek Campground is the same trail you hike down to the creek on at the put-in, so it is possible to hike five miles upstream along Siouxon from the take-out to the put-in. I don't think this would be a super-difficult hike, but I have never done it so I can't say for sure. I do know that the trail was often visible from creek-level, so I think it stays down low most of the way up. Assuming you drive up to the put-in trailhead: From the trailhead, follow the main trail as it meanders first down and then across a ridge. Soon the trail starts to drop down a long series of switchbacks lined with massive trees. You should be able to hear the creek at this point. After many, many switchbacks, you will be able to see the creek. Do NOT put on here, there are many, many logs downstream. Keep going until the trail reaches (and crosses) Calamity Creek, about 100 feet above the confluence of Calamity and Siouxon. The action starts immediately with a ledge at the confluence of the two creeks, just barely visible upstream in the first photo in this report. 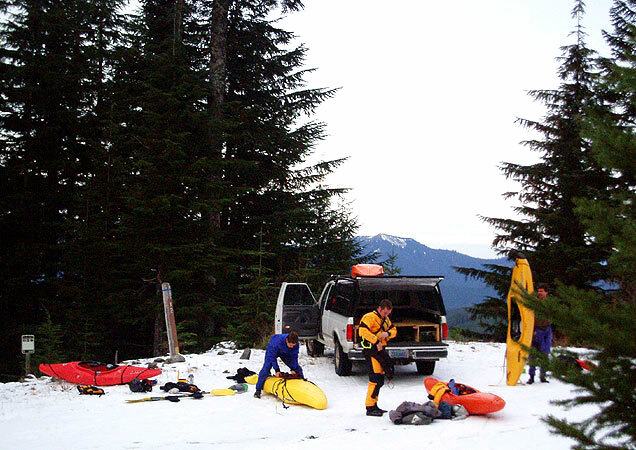 Paddlers have been exploring parts of Siouxon Creek since the 80's at least. 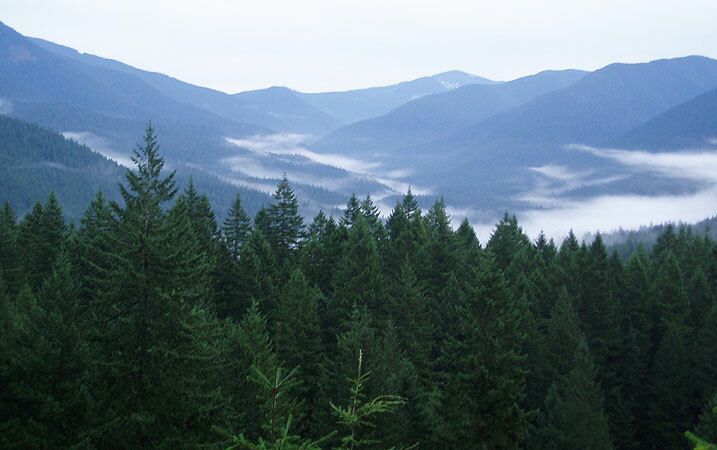 Scott Matthews is possibly the first person to have run Siouxon Creek. That said, it is a mystery to me how the uppermost reaches of this creek remained off of the radar for so long. If you have heard about any other adventures on this creek, let me know..